X to start day and also serve food. Left and Right to assign food to slots to be served. The goal of this game is to make as much money by capitalizing on food trends. Set your prices of each food everyday and then serve the exact food combinations the customers ask for. Demand for each food ingredient will increase or decrease depending on the price and how fast you serve the food. 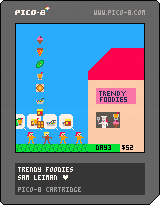 This game is a prototype made in Pico-8 made for the class Pixel Prototype Studio. I feel like the game gets the ideas of trying to capitalize on trends well, but it needs a lot of polish in visuals, sounds, controls, and the demand formula. This was made in a week, so it ends up being pretty messy. The proof on concept succeeded and with more dev time, I think this idea could be a strong game.